You'd think with all the Transformers named in the Generations era (A combination of the War Of video game series, Prime TV Series, and Novel series), that Hasbro could make sets of bots that were named in them. Instead Hasbro keeps picking known bot A, and then unknown bot B. In the case of poor Cosmos & Payload, they are both early Transformers, and both have been in cold storage for close to 30 years with very little attention. Alas poor Cosmos, I knew him well . . . 30 years ago. 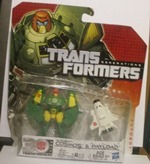 Cosmos played an interesting role in Transformers G1. He was like the little train that could. If you needed supplies from far off places, you sent Cosmos. If you needed someone to spy from the sky, you got Cosmos. Given his rather diminutive state he couldn't carry many Transformers, but if you could become small, Cosmos could take you anywhere. Despite how fast and loose they played with the rules in G1 they never pushed Cosmos to that insane state. Over the last few years he's had new figures of him made, but nothing really new content wise. He made a cameo appearance in Transformers Animated and didn't get a figure made. That was all then, and this is now. Now as it were we have this, "You may never meet a pair that is more eager to please than Autobot Cosmos & Payload. 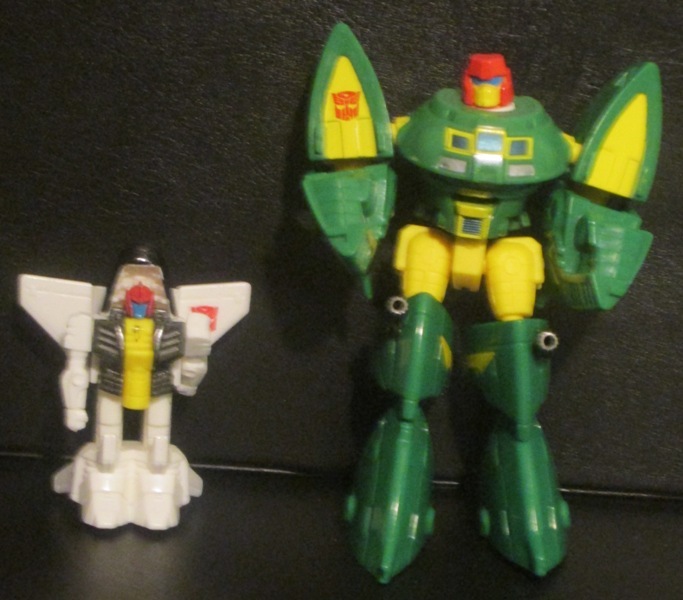 They're both proud of their ability to fly into space, and eager to use it to the benefit of the Autobot cause." Payload measures in at 2 inches tall, a nice little guy to work with Cosmos, given how his alt form is a Space Shuttle. In some ways he's a contras of colours. He has a nice black paint job on his chest, with the 5 MM post being a bright yellow. I just don't get his face which is blue and red. I mean seriously, the red helmet reminds me of Megatron. Colours alone does not alone make a Transformer. His arms have a 270 degree arc range give or take a few degrees, and if he is transformed properly. Like a lot of properly transformed microbots Payload lacks articulation. I've got to give him his dues, he has a high level of details. I mean I could measure some of the stuff I see on him in millimetres. He actually has proper feet and legs, which is a rarity on this scale. Mind you with his arms up, I just keep thinking of him as Superman for some reason. His hands have no holes to hold anything. It's very simple to transform him. Flip the arms, and the rear of the shuttle down. Now he looks like a NASA shuttle, or should I say half a NASA shuttle. His shoulders, and the backs of his legs are exposed. If you flip him over you see his robot side. I guess if you ever have a hard call to make, you can just flip him, robot side means yes, shuttle side means no? All kidding aside, While it does have its flaws (like why is his alt form from a race that is still living in caves), he looks decent like this. Payload transforms again, this time into a Gun/Blaster for Cosmos, or anyone lucky enough to wield him. Flip the arms up, flip the shuttle rear end up, push his feet up, and flip the peg in his chest down. Now, now he's a gun. In some ways he looks for the kind of weapon that is befitting a true partner for a transformer. His rockets become two gun barrels. He has a third one in the former end of the NASA Shuttle. The two spaces beside the third barrel make a nice scope. Don't get me wrong here, the wings (both horizontal and vertical) do look tacky. I think it's a compromise on the design. Given how I do own other Legends sized figures besides Cosmos. I did try him on an interactive level with the others. His weight does tend to cause them to tip over it at odd angles. For the record Cosmos can't hold him with Cosmos's arms at a 90 degree angle. It's the big bulge shuttle cockpit that prevents this from happening. As a fan who grew up on Transformers, I can't help but see the similarities between the old and the new Cosmos. Let's be honest here, 30 years have happened between them. Cosmos has great flexibility thanks to the ball joints in his hips and thighs. Yup, he has one of those strange three segment style legs. They pulled it off nicely, there isn't the strange he's walking like an insect deal. Heck, I would call him Stretch given how they look. For the record here he measures in at 4 inches. Forward facing his legs look great. He has a pair of blasters built into his legs so even if he's short Payload he can still be a threat. Given how from the middle to the bottom legs are connected via a short plastic joiner. I give Hasbro full marks for minimizing the size and impact of the pins on the overall design. The real flaw with him (and this is all of him) is if you face his back its open, but with a bot this big and small it's to be expected. Working our way up, Cosmos's can do the twist. He has 360 degrees turning ability. There is a gear system in there which anyone who likes to pose him will love. The arms are a weak point in the design. They can do 360 pinwheels thanks to the ball joints. The up and down arc in minimal. His hands can only really lock down in 90 degree gun slinger position. Yes, they do have mobility thanks to ball joints there, the problem is nothing really encourages you to use them like that. Let's transform him, shall we? Fold up the legs and arms, so they each form 1/4th of a circle. There are tabs and slots so they are easy to merge. Twist his legs around, and it does take work to get the ball joints lined up so these two quarter circles can become one. Force the unit up, and there are tabs in his lower torso that will link up with it. 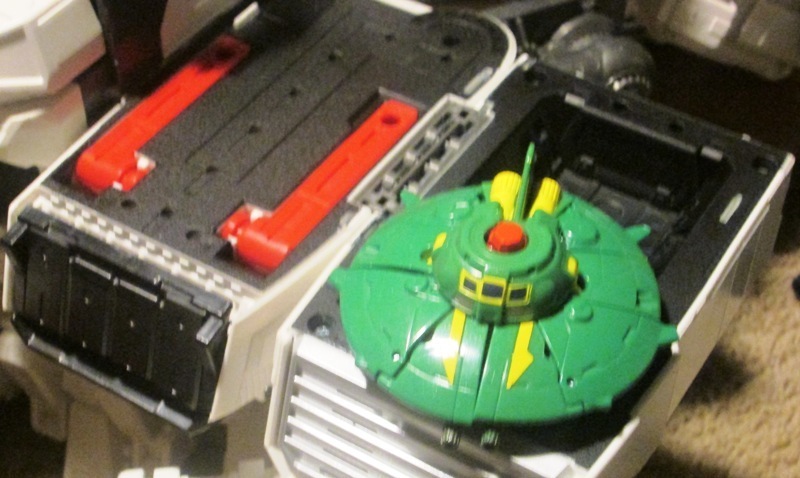 You will want to flip up his rocket boosters/tail so you can slide the back two into place. Lower the rockets down, along with his head and hey he's done! Unlike most other Transformers alt modes. Cosmos doesn't have really a beginner or an end point, comes with being a circle. I see a load of small detail in him, which is solid eye candy. Yellow lines on top, the guns on the bottom. This is Cosmos we've been waiting 30 years for! You flip him over, and you see the same level of detailing that you see on top. I'll give Hasbro full marks here, since they did what they could to cover the ugly side of him with as small an exposed space as possible. 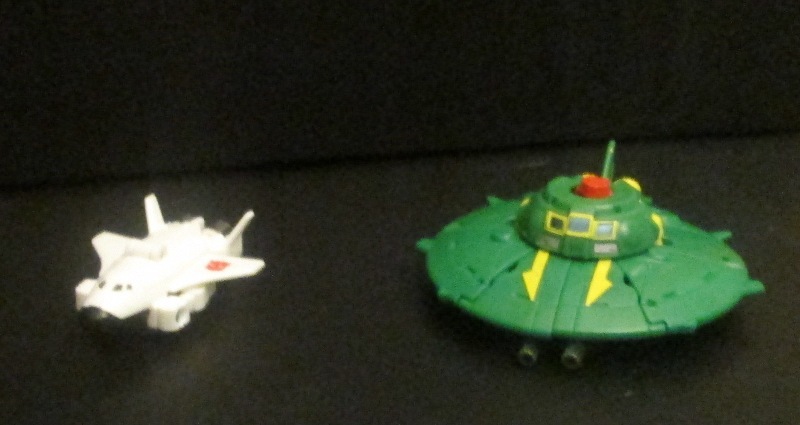 I think Hasbro worked from the flying saucer mode backwards when it came to making this version of Cosmos. From a play perspective, he's good, but he's bad. He slides across all surfaces I tested him on. However because he lacks wheels I can see his underside being scratched up as he's played with, or scratching any surface he slides on. Mind you since he is a "flying toy", this damage isn't expected. Transformer Design 6/10 As much as I love Cosmos and Payload. I feel the design was weak. All the tabs and slots to lock him up in UFO mode is a PAIN! Even lining up the ball joints so he pivots right is hard, and while Hasbro might rate him as easy, I am inclined to say he's more of a moderate Transformer on the difficulty scale. Durability 8/10 Like many mini-bots the partners of Legend class size figures. 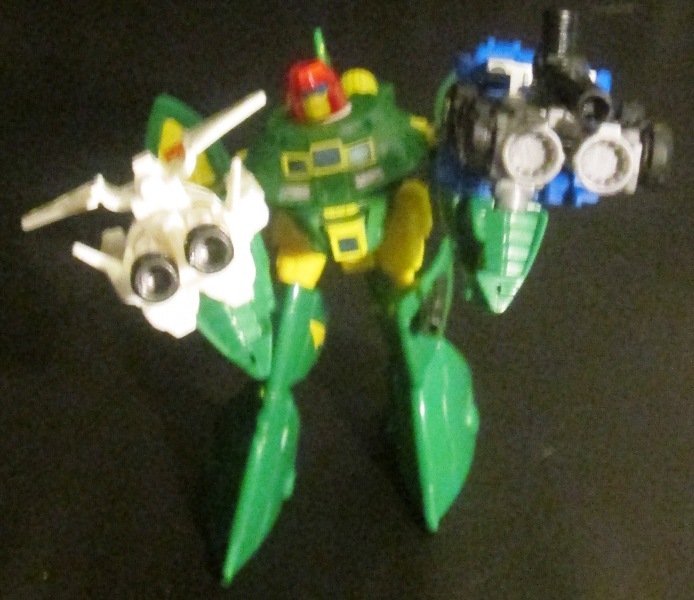 While I see many of the small wings and arms as being able to be ripped off, I view Payload as a solid figure. Cosmos, yeah he'll get scratched up, but he's solid for the most part. Nothing is loosely attached, or is small and weak that screams "BREAK ME"
Fun 5/10 Cosmos and Payload clearly have the flying space scenario. I can even see Cosmos asking Payload to go help bot X during a fight. Why then does he get a 5/10? Simple, Legend class figures were designed to interact with Metroplex, not be a standalone line. Because Cosmos only has hand holes that only face up, it is physically impossible for him to interact with Metroplex in robot mode. Aesthetics 9/10 Cosmos & Payload will never make the tough man competition look. However, Cosmos does look cute. I mean cute as a button. In some ways his look reflects his personality, he's a lovable loser. If he tried to act tough, he'd look foolish, so he acts harmless and innocent, and looks the role. The cute wingman so to speak. Articulation 8/10 Both of them in alt form don't have ANY articulation. In a rare moment, I defend them in this regard, how much articulation do shuttles, or UFOs have really? Payload has the standard level of articulation for a micro bot. While with Cosmos, I am impressed. He can hold a wide array of poses, heck he's strong in the sense he can hold up Prime's gun. Well designed, and easy to pose. Value 7/10 I paid $12 for Cosmos & Payload, it's the normal MSRP here for Legend class sized figure. If you are looking for a figure to plug into Metroplex, yeah then this is a 3/4 on 10. If you are looking for a cute bot, one who looks great in either mode, then yeah 7/10 is what they are worth when their solo play factor is included. Overall 7/10 I will agree that Cosmos & Payload aren't the best of the best, but they are solid in both sense of the word. From a collector's standpoint I like how both of them don't take a lot of shelve space while looking good, and from a kid's view point I see them as being fun to play with. I the only downsides are they don't really interact with Metroplex, and some parents might not like seeing Cosmos scratch up a table or a floor while he "flys" over it.